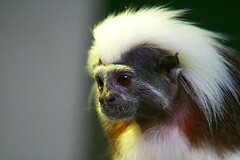 If there’s anything more so-ugly-it’s-cute than a cotton-top tamarin, with its dark little face and long white mohawk, I’ve not seen it. And tomorrow night, you can help save these critters at the Supporting Conservation Through Art Eco-Mochilas Exhibit, presented by the Cotton Top Tamarin Project, from 5:30 – 9 p.m. at Studio Gallery near Dupont Circle. Just in time for holiday shopping, there you can buy hand-woven bags called eco-mochilas. All proceeds will be sent directly to the communities in Colombia that make the bags, which serve as an alternate source of income to replace hunting endangered wildlife like the tamarins. Still not sure? Just listen to these guys chatter. It’ll melt your heart.